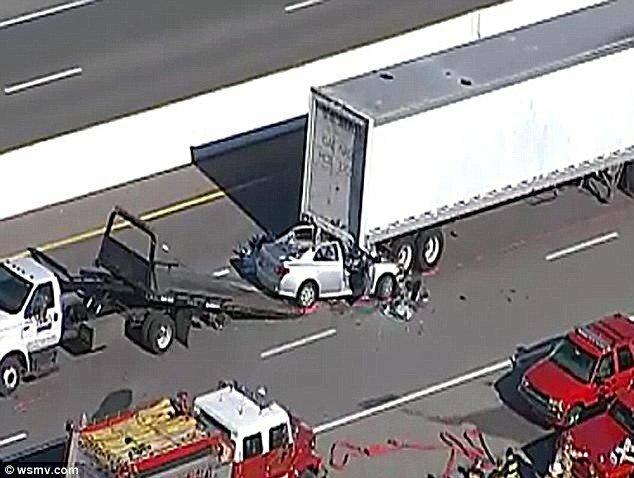 Home Tags Posts tagged with "who died in nashville’s 55 car pile up"
One person was killed in just one of the 55 collisions in a chain-reaction crash after a small car ploughed into the back of a U.S. Mail truck on a fogbound highway near Nashville, Tennessee on Thursday. It appeared the car struck stopped traffic during the morning commute, said Ray McLaughlin, a district chief with the Hendersonville Fire Department. As the fog lifted, damaged vehicles could be seen along a mile of Vietnam Veterans Parkway in Hendersonville. “I would compare it to a racetrack when there’s been a pileup,” Ray McLaughlin said. Ray McLaughlin said emergency workers counted 179 vehicles stopped at the crash scene, 55 of which had collided. The dead man was Paul Warren, 28, of Hendersonville, according to Shawna Zodi, a spokeswoman for the Hendersonville Medical Centre. Shawna Zodi said eight people were released after treatment for minor injuries. Other than the one death, most of the injuries were neck and back complaints, Ray McLaughlin said. Jim Carr, 41, of Hendersonville, said the curved overpass section of the highway had a thin layer of ice on it and the fog hindered people from stopping in time to avoid cars in front of them. “Once you had contact, you just looked in your rear view mirror and held on tight,” Jim Carr said of the cars crashing into one another. Jim Carr said after the wrecks, people got out of their cars and started checking other vehicles for injured passengers or drivers. He got out and tried to walk to the beginning of the pileup. “The fog was so thick, I walked for a while but I didn’t see the end,” Jim Carr said. Tom Johnstone, a forecaster with the National Weather Service office in Nashville, said the temperature in the region dropped to 25 degrees around the time of the crash occurred. There were reports to the weather service of freezing fog and a raised section of the highway where the crash occurred had become slick. Diana Denney, 57, was on her way to work in a café with her apron on when she saw the cars stopped in front of her. She pumped her brakes and came to a stop, but then her SUV was hit by other vehicles. “I started hearing all this banging behind me,” Diana Denney said of the sound of the crashing vehicles. Jim Carr said he’s going to take more precaution next time.